Europe’s anti-austerity swerve faces an uphill climb. 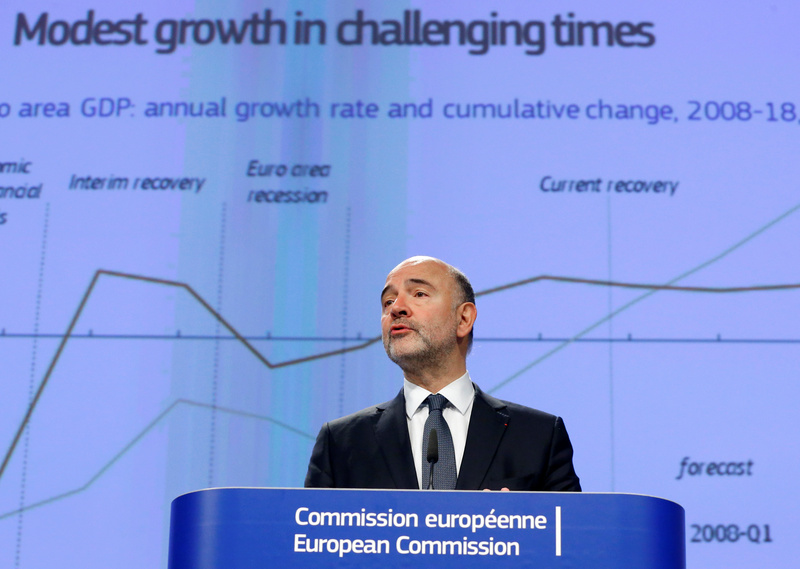 The European Commission wants euro zone countries to boost spending by 0.5 percent of GDP next year. It’s a belated attempt to head off Trump-style anti-establishment revolts on the continent. To make a difference, however, wealthy countries would have to help struggling ones. The commission’s proposal is an acknowledgment that euro zone fiscal restraints don’t work for the region as a whole. Rules that require individual countries to limit deficits mean overall policy is too tight. The euro area’s combined budget deficit will be just 1.6 percent of GDP next year, even though unemployment remains above 10 percent. The system also exacerbates the divergence between member states. Countries like Italy, where youth unemployment is nearly 40 percent, are bound to keep skimping on investment. Meanwhile wealthy Germany is still pursuing fiscal surpluses. These flaws could help hand victory to political parties in France, Italy and the Netherlands that advocate leaving the single currency or the European Union entirely. The lack of fiscal stimulus has also forced the European Central Bank to lower interest rates below zero – antagonising German savers. The commission’s proposal is for the region as a whole to spend up to 0.5 percent of GDP, or about 50 billion euros, on infrastructure and other projects. In practice that means Germany and the Netherlands will have to spend more, as weaker countries like Italy, Spain and France will still be bound to cut deficits. The commission optimistically expects the stimulus will more than halve the difference between the euro zone’s current output and its potential. The best result would be if rich countries pumped money directly into weaker ones. That’s a stretch. The proposals would imply Germany boosting spending by more than 1 percent of GDP, ING reckons, but the country’s constitution would limit a loosening to just 0.85 percent of GDP, according to Breakingviews calculations. The bigger obstacle, however, is politics. German Chancellor Angela Merkel, who faces crucial elections next year, has pledged to take on no new debt until the end of the decade. Voters might be swayed by the promise that extra spending would allow the ECB to relax its unorthodox policies and eventually raise interest rates. Such a dismal bargain may be Europe’s best hope. The European Commission on Nov. 16 proposed that euro zone governments boost spending by up to 0.5 percent of GDP in 2017. The proposal, published in a recommendation for the European Council called "towards a positive fiscal stance for the euro area", would see countries that are beating budget targets use their "fiscal space" to run bigger deficits to stimulate domestic demand and invest in infrastructure. Those that need to continue to lower deficits under euro zone rules should continue to do so. The proposal would be a change from member states' current 2017 budget plans, which imply a "broadly neutral" fiscal stance, as measured by their aggregate structural primary deficit, the deficit before interest costs, adjusted for the economic cycle.